Boil and cook jackfruit seeds in hot water until it becomes soft. In a pan add oil and splutter mustard seeds and urad dal. To this add dried red chilies and curry leaves. Add green chilies and onion to the mixture. 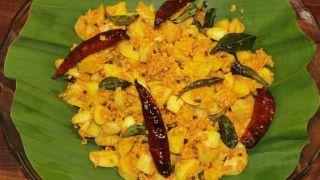 Add mashed jackfruit seeds and coarsely ground mix of coconut, cumin seeds, garlic and curry leaves. Now add chili powder and turmeric powder and mix well. Serve hot.